The National Library of Greece historic building. In 1834, the Library was relocated to Athens, the new capital of Greece, and was at first housed temporarily in the public baths building in the Roman Agora and then later in the Church of Panaghia Gorgoepikoos, next to the Metropolis Cathedral and close to other buildings that were important at that time. The collection increased rapidly. In addition to the purchase of books from private libraries, the Library accepted many large donations of books, like one from brothers Christoforos and Konstantinos Sakellarios or that from Markos Renieris. In 1842, the Public Library merged with the Athens University's library (15,000 volumes), and was housed together with the currency collection at the new building of Othon's University. By 1863, the Library was enriched with a number of significant donations and with rare foreign language books from all over Europe. With the royal charter of 1866, the two libraries merged, and were administered as the "National Library of Greece". ​The foundation stone for a new neoclassical marble building was laid in 1888. It was financed by three Kefallonian-born brothers of the Diaspora, Panagis, Marinos and Andreas Vallianos. It was designed by Baron Theophil von Hansen and its construction supervised by Ernst Ziller. This magnificent construction consists of one central building in the form of a Greek temple of the doric order of architecture and of two wings, all made of marble from Mt. Penteli with a base of porous stone. The statues of the Valianos Bros. are one before the façade and the two others in the vestibule. The Library remained in the older University building until 1903, when it was relocated to the new Vallianos building, which still partly houses the Library in addition to two other buildings, at Agia Paraskevi and Nea Halkidona. It is the largest library in the country, housing a unique range of thousands of books in all languages. On the façade is a stately six-column portico in the Doric style, based on the design of The Temple of Hephaestus. The interior, designed by Ernst Ziller, is lighted by a skylight on the roof and encompassed by an Ionian style colonnade. The 20-hectare Delta is a seafront area that used to host the Athens horse race track, which was relocated in time for the Athens 2004 Olympics. 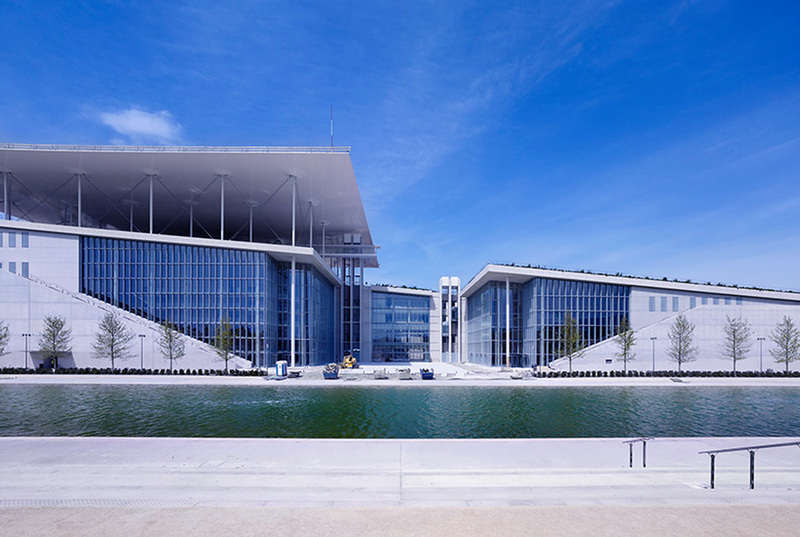 Renowned Italian architect Renzo Piano proposed a radical new plan for the National Library and the National Opera House of Greece, and the project was funded by the Stavros Niarchos Foundation and donated to the Greek state. The two buildings will be integrated within a landscaped park with indigenous flora, and will feature extensive renewable energy facilities and a central plaza around a 30 meter wide seawater channel. Work on the project started in 2012 and completed by the end of 2016. 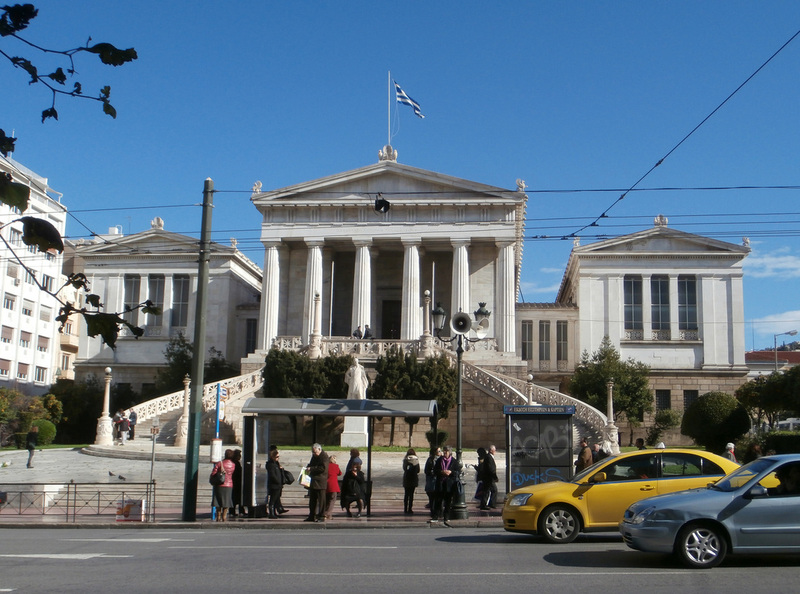 ​​The new building for the National Library of Greece will modernize an institution, allowing it to strengthen its research role while expanding its focus from an exclusive research facility to an all-inclusive public resource. In its new and enlarged role, the Library will support patrons of all ages and education — from academic researchers to children and young adults destined to become the next generation of users. Within its new premises, at the Stavros Niarchos Foundation Cultural Center, the entrance to the Library leads into a large open lobby that provides an immediate visual orientation to all the organization’s functions. The lending library, bolstered by a significant book collection and other media, will include separate areas for adults, teenagers, and children and will offer a wide range of educational and cultural programs. The natural light available throughout the National Library will help create an open hospitable environment for individual and collaborative learning. Events and seminars will be hosted for both children and adults, and classes will incorporate natural learning opportunities originating from collaborative programs at the Stavros Niarchos Park as well. The nearly 22,000 m2 (235,000 sq. ft.) state-of-the-art building combines traditional with technological innovation, conservation with information and communication. The flexibility of its design, informed by consultations with the prominent British Library, ensures that the National Library can respond effectively to ever-changing needs and the challenges of the digital age. A nationwide digitization project will help make heritage materials available to the public and will offer access to the Library’s various collections. Connectivity with other libraries both nationally and globally will allow the Library’s users access to material abroad that is relevant to Greece or Hellenism. In addition, a Business Center will provide the public with an active hub for enterprise, knowledge, and innovation, offering computer workstations, laptops, and wireless connectivity. ​A modern academic research facility within the National Library will be an exemplar for other institutions. The new building will enable all existing research collections, currently located in three separate buildings, to be housed in a centralized location, with optimized access to collections for researchers and scholars. ​Modernized climate control and preservation and digitization facilities will ensure that the Library’s significant rare manuscript collection is available for future generations of scholars. 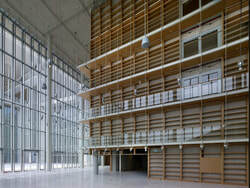 The National Library of Greece will also have the capacity to function as a venue for exhibitions of its holdings. Selections of the National Library’s manuscripts could be exhibited on a rotational basis, affording the public the opportunity to view Greece’s treasures and cultural heritage. 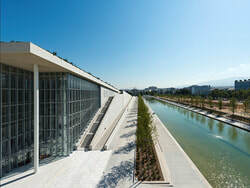 The new building of the Greek National Library at the Stavros Niarchos Foundation Cultural Center.